sassyfrazz: Rozoni Smart Taste Pasta & Contest!! to make for a large family, but it goes a long way. I have been searching the nutrition facts on the boxes of pasta, and it can be a challenge finding a pasta that offers lower calories and higher fiber, but still be affordable. Rozoni's Smart Taste is a great tasting pasta/noodle and it offers the higher fiber and lower calories, yet it isn't over priced. Our family has made the switch over to Smart Taste over other brands because we love the taste, it is lower calories, and it is in our budget. We have tried other brands in the past, and we really can't taste any difference between the brands, so it is an easy choice. RONZONI SMART TASTE is part of New World Pasta, the leader in healthy pasta. Our family of brands consists of Ronzoni Healthy Harvest® and the New World Pasta classic white pasta brands of Ronzoni®, Creamette®, Prince®, American Beauty®, Skinner® and San Giorgio®. New World Pasta is also home to Light 'n Fluffy® egg noodles. Learn more about New World Pasta." 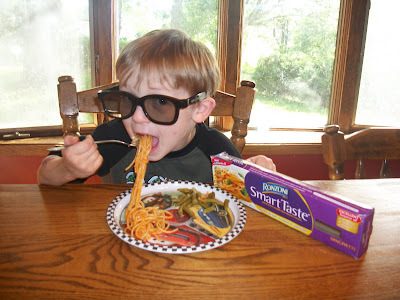 Our family loves the Rozoni Smart Taste pasta! We made the Spaghetti noodles with Vodka cream sauce and grilled chicken, and it was delicious! Our kids happily ate their meal, as you can see in the photos, and they all wanted seconds. The family doesn't notice any difference in the taste of the pastas, and for the nutritional values of the Smart Taste, our family will eat Smart Taste! With reviewing the Rozoni Smart Taste Pasta, I have a chance to enter the photo contest for bloggers! Please Vote for my little Spaghetti Stud! (see picture at top) I have a chance to win the grand prize of $500 and a year’s supply of Smart Taste Pasta! Voting will be open on June 14th at http://www.Ronzonismarttaste.com/blogger and stay open until June 25th. You can vote once per day, and I would be forever grateful if you could help me out.